An honour granting Aung San Suu Kyi the Freedom of Oxford will be withdrawn by the city council because of her response to the Rohingya crisis. 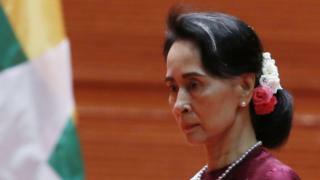 The de facto leader of Myanmar was granted the honour in 1997 for her "long struggle for democracy". But a motion, backed by Oxford City Council, said it was no longer appropriate for her to hold it. More than half a million Rohingya Muslims have fled Myanmar to Bangladesh following recent violence. The trouble erupted on 25 August when Rohingya militants attacked security posts, triggering a military crackdown. Ms Suu Kyi spent years under house arrest in Rangoon as a campaigner for democracy while Myanmar (formerly Burma) was ruled by a military dictatorship. She became a worldwide figurehead for freedom before leading her National League for Democracy party to victory in open elections in November 2015. But her failure to denounce the military or address allegations of ethnic cleansing has been criticised by world leaders and groups such as Amnesty International. Oxford City Council backed the motion at a meeting on Monday. Bob Price, the authority's leader, said evidence coming out of the United Nations meant she was "no longer worthy" of the honour. It will be formally taken away at special meeting next month but the decision could still be reversed at that point if the situation in Myanmar changed, councillors stressed. Other organisations are now reconsidering honours given to Ms Suu Kyi, BBC world affairs editor John Simpson said. "I think it is perfectly natural to look around for ways of saying we disapprove utterly of what you are doing," he told BBC Radio Oxford. Last week it emerged St Hugh's College, Oxford, had removed a portrait of Ms Suu Kyi from display.